The beta of Microsoft’s latest update of its free Windows Live Essentials line of online applications — which Microsoft calls Wave 4 — was recently released to reviewers and beta testers; the final release is expected sometime this summer. It’s a grab-bag of useful, if often unrelated, applications that offer a variety of services for doing things such as managing photos, creating videos, checking e-mail, doing instant messaging, writing blog posts and synchronizing data among PCs. Whether you’ll be impressed with this newest version will depend on whether you view it as a single, coherent product line or as a group of disparate applications. As a coherent product line, there’s no clear theme tying everything together. But the individual products are useful, solid pieces of work and often quite powerful, given that they’re free. In fact, they’re some of the best free applications you’ll find anywhere and are well worth the download. The Wave 4 release of Windows Live Essentials comes about a year and a half after the Wave 3 release. The new release has a lineup of applications that is almost identical to that of its predecessor: Windows Live Mail, Windows Live Messenger, Windows Live Photo Gallery, Windows Live Movie Maker, Windows Live Sync, Windows Live Writer, Windows Live Family Safety and the Bing Bar (which replaces the previous Windows Live Toolbar). Windows Live Essentials works only with Windows Vista and Windows 7, so Windows XP users are out of luck. Some features have been optimized for Windows 7 — for example, Windows Movie Maker can make use of codecs built into Windows 7. Some of the offerings in Windows Live Essentials are applications that originally shipped with Windows but were stripped out in Windows 7, such as Windows Live Mail, Windows Live Photo Gallery and Windows Live Movie Maker. Other applications, such as Windows Live Sync and Windows Live Writer, are unique to Live Essentials. In this review, I’ll look at the changes in this beta version of Windows Live Essentials compared to Wave 3. The sleeper of the group that has gotten very little notice is Windows Live Sync. That’s a shame, because for people with multiple PCs, this little app may be the best of the bunch. Beyond that, it could provide an important syncing foundation for many other Microsoft products in the future, including the Web version of Office. As with previous versions of Windows Live Sync, you install the software on each computer that contains folders you want to synchronize. 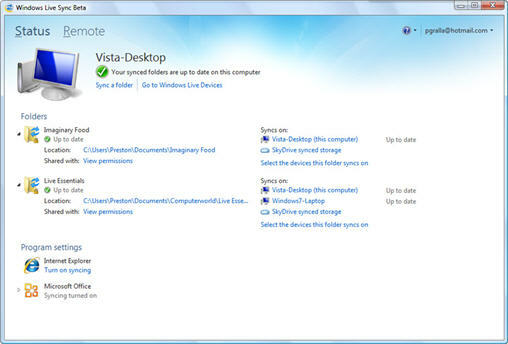 The application finds other computers that have Windows Live Sync installed; you can then choose the folders that you want to synchronize, and on which computers you want them synchronized. The software does its magic in the background as you work. This new version of Windows Live Sync has a new client interface for controlling synchronization; it now shows you more detail about all the folders on a computer you want synchronized — which device they synchronize to, synchronization status and so on. You can also choose to share the folders with other users. How? Well, with this version you can sync your folders not just from computer to computer, but also to the free Windows Live SkyDrive Web-based storage service, where you get 2GB of free storage space. That means that Windows Live Sync doubles as a simple backup service. It also means that you’ll be able to get access to your files from any Internet-connected computer. You can also synchronize your Internet Explorer Favorites and a variety of Microsoft Office settings, including templates and e-mail signatures, among multiple computers. Windows Live Sync makes it easy to synchronize files and folders. An especially useful new feature, taken from an older Microsoft service, Windows Live Mesh, is the ability to take control of one of your Windows computers via a remote Internet connection. I tried it out and found that it was quite easy — I was able to control a remote PC as if I were sitting at its keyboard. Anyone who has struggled with setting up Windows’ built-in Remote Desktop Connection will welcome this new tool. Windows Live Sync is so useful that it’s surprising that Microsoft hasn’t baked it into all of its products, such as Microsoft Office and the Web-based Microsoft Office Web Apps. Perhaps that will come in the future. When Microsoft decided to kill the Windows Mail desktop client back in 2007, not everyone was pleased. Windows Mail had been an update to Outlook Express, was built into Windows Vista and was a nice piece of work, although not as powerful as full-blown Outlook. Microsoft subsequently made it available as a free download under the name Windows Live Mail. This latest version of Windows Live Mail represents a significant improvement over the previous version. The big change here is the addition of the Ribbon interface, found in Office 2007 and 2010 applications, and a calendar pane (which gives you access to the calendar that is in Windows Live Mail). This makes Windows Live Mail much more Outlook-like. In fact, at a first, quick glance, you could almost mistake it for Outlook. The new version of Windows Live Mail looks much more like Outlook. Also useful is the new Conversation View, similar to the one introduced in Outlook 2010, which makes it easy to follow threaded conversations with one or more people. Every e-mail with more than one message has a small triangle next to it. Click the triangle to see a chronological list of every message in the conversation; click any message to jump to it. It’s a fine time-saver. 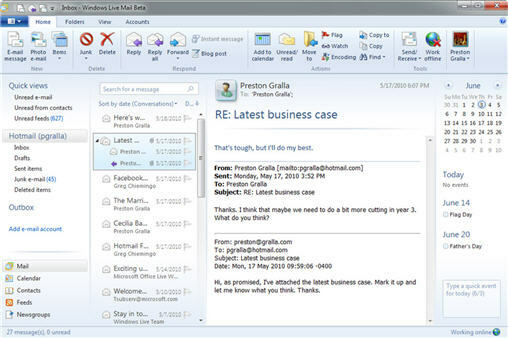 Windows Live Mail also lifts several features from Hotmail. As with Hotmail, if you want to share photos with others via e-mail, you can send a photo album. Create your e-mail, click the “Photo album” icon, and choose your photos. Windows Live Mail then formats your images into a nice-looking album (using thumbnails) in your e-mail, and also stores the photos on your Windows Live SkyDrive account. Recipients can click the thumbnails and be sent to the full-size images on SkyDrive. This solves the problem of ISPs blocking messages with too-large attachments. Microsoft has also given its instant messaging application, Windows Live Messenger, a facelift — most notably by integrating it closely with social networking sites. There are now two views in Windows Live Messenger: a compact view, which looks very much like the old Messenger interface, and a new (and default) full view. The full view is designed to make Messenger not just an instant messaging application, but instead a central hub for your electronic communications, with a full view of activities on your social networks and the ability to interact with them without having to actually visit those networks. At this point, Live Messenger only partially fulfills that promise, because it integrates with only Facebook and MySpace, and leaves out other important social networking services such as Twitter. So, for example, you can see Facebook and MySpace friends and their updates from within Windows Live Messenger, and share your status with your Messenger contacts. You can make comments on your friends’ Facebook posts from within Messenger, view videos they’ve posted, and so on. Windows Live Messenger now features integration with social networks. Will these changes be enough to make you begin using Windows Live Messenger if you don’t already use it? Not likely. But existing Windows Live Messenger users will be very pleased by what they see, especially if they’re also users of Facebook or MySpace. The previous version of Windows Live Photo Gallery was a solid piece of work — a good tool for organizing and viewing photos and for performing basic photo editing tasks. This new version juices it considerably, not only redoing the interface but adding some very clever new features such as face recognition. As with Windows Live Mail, the primary change to the interface is the addition of the Ribbon. (Notice a pattern?) The Ribbon is particularly welcome here, because a considerable number of new editing tools have been added, and without the Ribbon interface, they would have been difficult to reach. 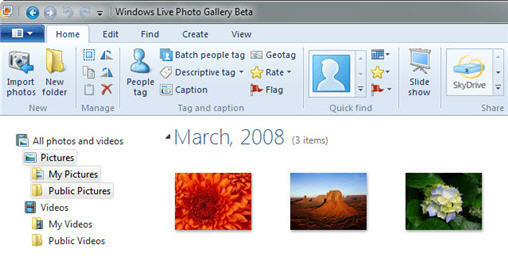 Windows Live Photo Gallery now sports a Ribbon-based interface. These tools include a Retouch feature for removing blemishes, scratches and similar glitches. You can also auto-adjust batches of photos at a time, changing color balance, sharpness and exposure. The new Photo Fuse feature is nifty and will be welcomed by everyone who has ever taken group photos. It works this way: Let’s say you have two photos of the same group of people. In one photo, two of the people are blinking, and in the other photo, two other people are yawning. With Photo Fuse, you can replace the faces from one photo with faces from another and come up with a photograph in which no one is blinking or yawning. The resulting image doesn’t come out absolutely perfect — you may notice a bit of ghosting — but it will be better than either of the original photos. Also new is a face recognition feature. When you tag a photo of someone in Windows Live Photo Gallery, you can ask the software to look through all of your other photos, and find pictures of that person in other photos so that you can tag those as well. When used on Windows 7, Windows Live Photo Gallery also includes a wizard-like import tool that launches when you plug a device with pictures or videos on it into your computer. It’s easy to share photos and videos with a variety of sites, including Facebook, YouTube, Flickr, Windows Live Groups and your SkyDrive account. On the Ribbon, you click the icon of the site where you want to share photos, and it takes one more click to share them. There’s also integration with other Windows Live Essentials software. You can, for example, send a photo e-mail from within Windows Live Mail. 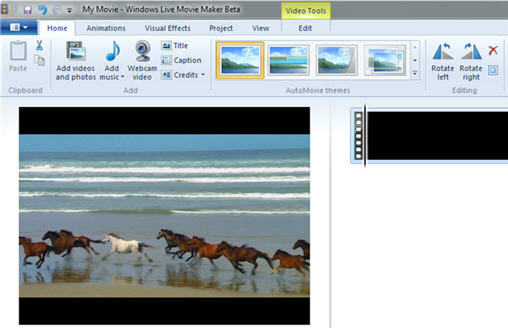 The most significant change you’ll see in the new version of Windows Live Movie Maker is — surprise! — that it now gets the Ribbon treatment. But there are several other useful changes as well. For example, Windows Live Movie Maker sports the same interface on the Ribbon as Windows Live Photo Gallery for sharing videos via SkyDrive, Facebook, Windows Live Groups and YouTube. Also notable are the new AutoMovie themes, which add a title, transitions, captions and a soundtrack to your video. You get a choice of six themes, such as a Sepia theme that turns your movie sepia-toned. In addition, Movie Maker now features a live preview feature, so you can see your movie in the playback window before making any changes. Windows Live Movie Maker shares videos via SkyDrive, Facebook, Windows Live Groups and YouTube. Microsoft has updated or introduced several other tools in its Live Essentials suite. The Windows Live Writer blogging tool has gotten a minor redo, with — yes, you guessed it — a Ribbon interface. In addition, built into Writer is a way to easily link to SkyDrive-based photo albums and display them, so you don’t have to create and embed that code yourself. You can also embed a Bing map into your blog. Apart from this, though, there’s not much new. Windows Live Writer remains a nifty front end to a variety of blogging applications, including Blogger, WordPress, TypePad, Windows Live Spaces, SharePoint and others. Note that, depending on your blogging service, it may either be very simple or very difficult to get the software to work with it. It’s very easy to get it to work on Blogger, for example, but when you try to get it to work on a site that may have built its own blogging front-end with WordPress, it can be tough to do. Microsoft’s new browser toolbar, the Bing Bar, takes the place of the old Windows Live Toolbar. There are versions for both Internet Explorer and Firefox. It adds the Bing search box on the left-hand side of Internet Explorer’s toolbar, which is overkill, considering that there’s already a search box on the upper right-hand side of the browser. There’s also an autofill function for filling out Web forms, and links to various Microsoft services, such as Bing video, Bing weather, MSN stocks, and so on. If you like that sort of thing, you might find it useful, although many people will find it superfluous. Windows Live Family Safety is a piece of software that I believe few people will ever use. It is intended to fill a hole that Microsoft created when it inexplicably weakened parental controls in Windows 7. This new version appears to work very much like the old version; I was unable to discover what was new. Windows Live Family Safety requires such a ridiculously confusing setup that it’s hard to imagine anyone going through the pain required to use it. You’ll need to create a separate Windows Live ID for every child, and then link those Windows Live IDs to a master parental Windows Live ID, then map the IDs to individual user accounts… let me just stop there, and say it’s not worth the effort. Taken on an application-by-application basis, the newest version of Windows Live Essentials is a clear success. Windows Live Sync, for example, is probably the best free syncing product I’ve ever tried, and I’ve tried quite a few of them. And I don’t think I’ve seen a free video-creation tool as powerful as Windows Live Movie Maker, either. Photo Gallery is an excellent application, if not necessarily the best free one in its class, and Windows Live Mail is also good, although not as powerful as, say, Thunderbird. But whether you try the entire set or only a few apps, there’s something here you can likely use. Taken as a coherent product line, though, Windows Live Essentials is not a success. What does a browser toolbar like Bing Bar have to do with the movie-creation application Windows Live Movie Maker? Nothing, really. And therein lies the problem. Although there are some links between Windows Live Essentials applications — for example, making it easy to send an e-mail full of photos from Windows Live Photo Gallery — these are all really stand-alone applications. And only in some instances is there direct integration with Microsoft’s free cloud-based file storage service, SkyDrive. One can’t help thinking about the possibilities inherent some aspects of Windows Live Essentials — notably with Windows Live Sync. If Microsoft properly developed it, the company would have the makings of an exceptionally powerful cloud-based set of services with links to client applications, something that Google can’t currently match. Imagine if the Web-based and client-based versions of Office used SkyDrive for common storage, backup and synchronization, with Windows Live Sync providing the synchronization services. Imagine if Windows Live Photo Gallery similarly featured online-offline synchronization tools. You could get the best of cloud-based computing and client-based computing, and not need to worry or think about where the file you were currently working on was stored — the latest version would be on whatever device you wanted whenever you needed it. So download Windows Live Essentials for what it offers, because there’s a lot to like. But like me, you may well wish for a coherent product line with synchronization services linked to other Microsoft products. Preston Gralla is a contributing editor to Computerworld.com and the author of more than 35 books, including How the Internet Works (Que, 2006).